People constructing walls in front of their houses as barricade, some were sweating and in hush-hush, another shouting in ununderstandably, and apparently panicked appearing through his severing voice. It was12:15 AM mid-night when we saw everybody still awake, though the milieu was supposed to be calm and halcyon – but, the condition then was something different. Police, Army and volunteers are still in full-alert 24/7, transport, electricity, irrigation officials are put on duty 24/7, sirens blaring every now and then carrying boats and hurling towards the affected regions of Bangkok. Shopping malls and convenience stores are completely empty – no water, no dry foods, nothing at all, though the convenience stores are open 24/7 – good for nothing in this crisis situation. It is getting even more worse as the water is inching every hour towards Bangkok. This is the usual route for water to finally end up meeting sea. “The force and the volume of water is so enormous that it takes just couple of hours to reach to a level that can drown 5 feet person”. Last night we were informed that the water will be approaching to our street by 11 PM – police announced, as we were told 2 days ago, but the only difference between these two preparative information was that the earlier one was just from the locals while this time it I something more serious – its from the police and metropolitan department. People starting getting even more worried and appeared panic though they knew – it is coming! They started constructing more higher wall adding bricks to already existing 1 meter walls – though the height is highly variable in this city depending on the people’s own perception. I could see some have put the plywood walls, while other seems more prudent setting up good, think concrete walls around their house, ATMs, water-dispensers, while other seems they are just teasing water saying, “Okay! Come on, I have been waiting for you so long” with just few sandbags that are hardly bigger than a small kid-size football with even gaps between the bags. I don’t understand how are they supposed to keep water out with that kind of preparation. And, there comes, another one – with wall as high as a normal human height or even higher. I think, they might be thinking that they are more safer and probably will sleep tight at night thinking that whatever happens, water can’t enter their house. But, God save them!, if in case, water will be higher than that – which seems virtually impossible to reach to that level – they will drown in their own house with no way to escape. The situation is even more dangerous because the water will not come from far away, it will start oozing out from every lids of the sewerage and water canals and channels and the complex network of water system inside the city underground. So, there is apparently no narrow escape anywhere than to holed up in some higher ground or of building tops. The force and the volume of water has appeared so enormous in the already devastated provinces that it takes just couple of hours to reach to a level that can drown 5 feet person. Last night we left our apartment at around 9 PM in group to have a glimpse of situation near our hospital which stands majestic on the bank of the biggest river – Chao Pharaya river which is in the most vulnerable list. The government announced special holiday from October 27 to 31, 2011, stating even more dire situation because of sea-tide between October 27 till October 31 which will stop water flowing into the sea leading to continual accumulation of water in the cities uphill. However, our university has announced holiday till November 7, 2011 with all classes already postponed. We were amazed to see the spirit of the volunteers and students working hard without sparing even second while they were filling, tying, putting knots and hurling sand bags from hand-to-hand. 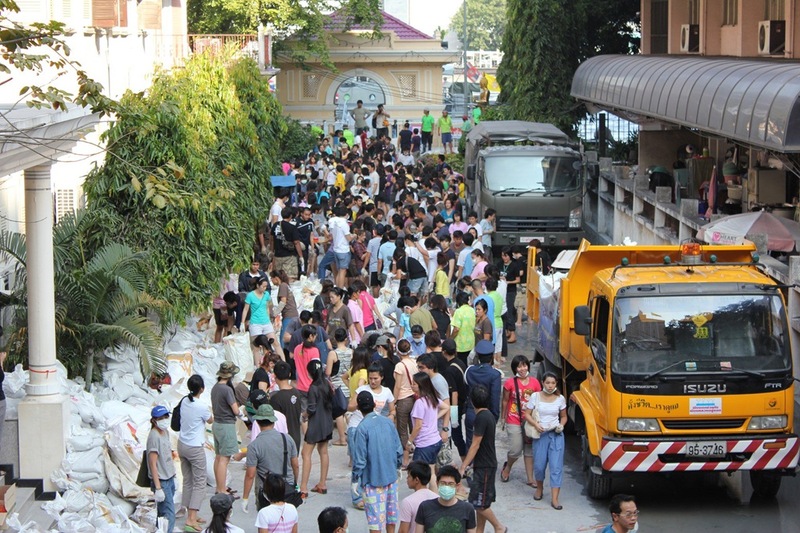 Without any moral, gender or nationality division: international students, international exchange students, medical students, nurses, staffs – everyone was toiling, preparing and bracing for the natural disaster inching towards the city every hour – all set to welcome the furious mother nature in form of water determined to sweep everything on her way. We also helped them as much we could from our side. There were other foreigners as well assisting them in whatever way they could. After 2 hours another bunch of volunteers came to replace the earlier one and the process continued. It’s very difficult to control or mitigate the devastating effect of natural disaster, but it is commendable to help and be together in times then to just wait-and-watch. Very few people have this spirit, mentality and mindset and we got to learn something from people around the world. It’s time to change our perception! This is high time! And, there is nothing wrong in accepting and confessing our shortcomings and move forward to change. That’s why it is said, “There is always the next time”. And, “It is never too late to start”. Date: October 26, 2011. Time: 10:46 AM. Next Next post: Dear prime minister,are you kidding me?